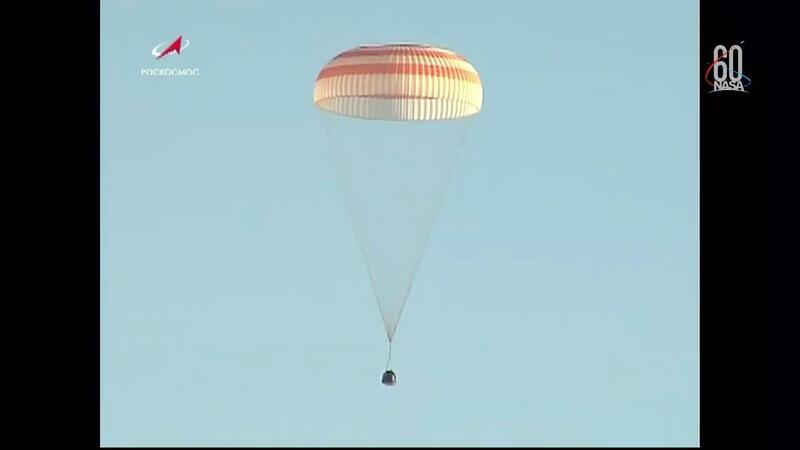 Three crew members who have been living and working aboard the International Space Station have landed safely in Kazakhstan. Expedition 56 Commander Drew Feustel and Flight Engineer Ricky Arnold of NASA, along with Flight Engineer and Soyuz Commander Oleg Artemyev of the Russian space agency Roscosmos landed at 7:44 a.m. EDT (5:44 p.m. in Kazakhstan) southeast of the remote town of Dzhezkazgan in Kazakhstan. The crew completed hundreds of experiments during its 197-day expedition. Highlights included an investigation to study ultra-cold quantum gases using the first commercial European facility for microgravity research, and a system that uses surface forces to accomplish liquid-liquid separation. The crew also welcomed five cargo spacecraft that delivered several tons of supplies and research experiments. The 14th SpaceX Dragon arrived in April, shortly after the three crew members did, bringing supplies and equipment, and the 15th Dragon arrived in July. The ninth Northrop Grumman Cygnus resupply spacecraft arrived in May before the end of Expedition 55. A Russian Progress completed a record rapid rendezvous of less than four hours in August. And, the seventh Japanese Konotouri cargo craft arrived just a week before the Expedition 56 trio departed for home. Both Feustel and Arnold participated in dozens of educational events while in space as part of NASA’s Year of Education on Station, reaching more than 200,000 students in 29 states. Feustel now has logged more than 226 days in space on three spaceflights, and Arnold more than 209 days on two missions. The duo ventured outside the space station on three spacewalks to effect maintenance and upgrades during Expeditions 55 and 56. Their work included replacing and upgrading external cameras, including those that will facilitate the approach and docking of the Boeing Starliner and SpaceX Crew Dragon commercial crew spacecraft when they begin launching soon from American soil. The spacewalkers also replaced components of the space station’s cooling system and communications network, and installed new wireless communication antennas for external experiments. Feustel has accumulated 61 hours and 48 minutes over nine career spacewalks, and ranks third overall among American astronauts. Arnold has 32 hours and 4 minutes over five career spacewalks. Artemyev conducted one spacewalk with fellow cosmonaut Sergey Prokopyev to manually launch four small technology satellites and install an experiment called Icarus onto the Russian segment of the space station. The spacewalk timed out at 7 hours and 46 minutes, the longest in Russian space program history. Artemyev now has spent 366 days in space on his two flights. Expedition 57 continues station research and operations with a crew comprised of Serena Auñón-Chancellor of NASA, Alexander Gerst of ESA (European Space Agency) and Sergey Prokopyev of Roscosmos. Gerst assumed command of the station as Feustel prepared to depart. NASA astronaut Nick Hague and Roscosmos cosmonaut Alexey Ovchinin are scheduled to launch Oct. 11 for a same-day arrival, increasing the crew size to five. Artemyev conducted one spacewalk with fellow cosmonaut Sergey Prokopyev to manually launch four small technology satellites and install an experiment called Icarus onto the Russian segment of the space station. The spacewalk timed out at 7 hours and 46 minutes, the longest in Russian space program history. The longest Russian spacewalk was 8 hours and 12 minutes on February 2nd, 2018 !